Interests:Video Games and becoming one of the best Puyo Puyo players. It's funny because I imagined them doing this a long time ago and now here we are. I can definitely say I called it and so excited for this. As for the paid online I have no opinion on it since I already do that on Xbox and soon Playstation so it is all the same to me. Too bad only two of those characters will be in the game. I'm interested but not hype since I still need to see the roster, you can put money on Ike and Roy appearing because of smash but outside of them I expect little appearance from games not Awakening Fates. KT likes to use popularity polls and such things so I expect there to be a lot of Fate Awakening. It will be a nice surprise if they distribute the roster equally though. Coolio man. Hyrule warriors was great, can't see this bein too bad. I don't want to get to excited about it because when I think Fire Emblem I think the 3 GBA games. I like Awakening and Fates just fine but I those characters didn't stick with me as well. Until I see a healthy chunk of GBA characters on the roster I'm keeping my hype for the game under control. I expected Roy but I'm pleased and surprised to see Lyn. To be honest I don't care for who is in the game the most important thing I want to know is how they will put in some of Fire Emblem's mechanics into a Warrior game. I can see how the weapon triangle will work because without that it would not feel like a Fire Emblem game in my opinion as well as the maps. I am curious if they will use some of the maps from the previous game. It would be really cool to see for Fire Emblem fans. If you think Hyrule Warriors is stressful then you are not ready for any Warrior game that has been made thus far and I include Dynasty Warriors. Hyrule Warriors is not all that stressful in Legend mode but damn is Adventure mode ever hard. I'd advise trying Dynasty Warriors first before making your decision. Liking any Warrior game comes from trying out Dynasty Warriors to see if you like it or not. Oh man, so the actual warriors games are even worse about piling on 50 different goals at once? Yeah but you have a choice to ignore them. But there are certain objectives that can unlock certain stages or paths. I usually ignore the people who are not important and work my way to the important objective unless a character I really like is having trouble. Fire Emblem Musou's roster will mainly consist of characters from the Fire Emblem™: Shadow Dragon, Fire Emblem™ Awakening and Fire Emblem™ Fates games, however it is more than likely that characters such as, e.g Roy, Lyn and Ike, will be added into the game later on as purchasable downloadable content. 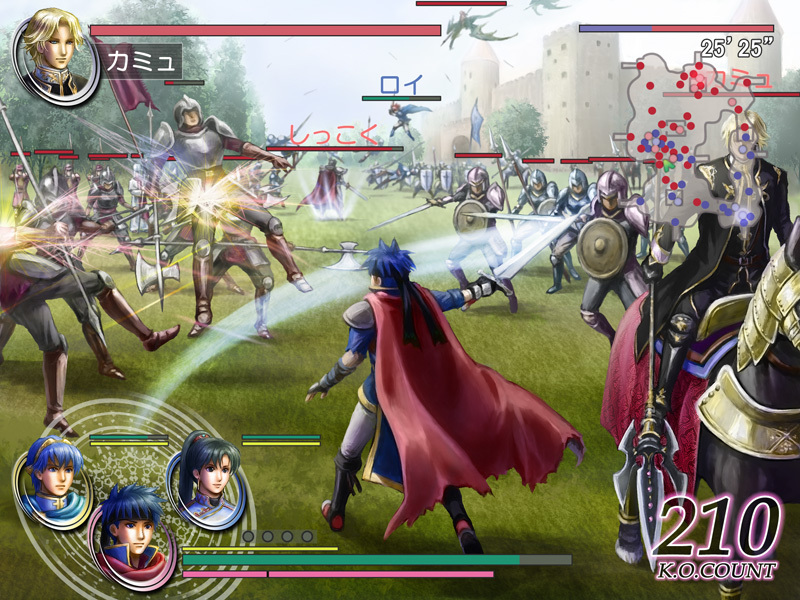 The characters that have been announced as playable thus far, including the two original game-exclusive characters, i.e Rowan (Shion/Zion in the Japanese version) and Lianna (Rian/Lian in the Japanese version), are Chrom, Marth (based upon his iteration from Fire Emblem™: Shadow Dragon), Corrin (Female (Kamui in the Japanese version)), Ryoma, Xander (Marx in the Japanese version), Robin (Male (Reflet in the Japanese version)), Lucina (me, of course.~<3 ^^")), Lissa (Liz in the Japanese version), Frederick (Frederik in the Japanese version), Robin (Female (*whilst both iterations of Reflet are to be playable in-game, the Female iteration of Reflet will not be playable during the Story Mode of Fire Emblem Musou)), Cordelia (Tiamo in the Japanese version), Camilla, Leo (Leon in the Japanese version), Takumi, and Hinoka. Fire Emblem Musou is to be released on the New Nintendo 3DS, New Nintendo 3DS LL/XL handheld consoles and Nintendo Switch hybrid console in Japan on September 28, whereas it is to be released on October 20 in Europe, Australia and North America. Fire Emblem Musou will receive two editions, the Premium Box and TREASURE BOX Editions, for both the New 3DS handheld consoles and Switch hybrid console, in Japan; the Premium Box comprises of the game, itself, along with the "Fire Emblem Musou" Official Setting Material Collection (80P), "Fire Emblem Musou" Official Soundtrack CD (3-Disc Set) and Character Post Card Set. The TREASURE BOX Edition will come with the exact bonuses as previously stated in the Premium Box Edition, however a "Dragon stone" crystal (with voice (It is a crystal imitating a dragon stone. The pedestal with LED light and voice function!) will be exclusively bundled within the TREASURE BOX Edition. As opposed to Japan; Europe and Australia will receive a Limited Edition of their own, whereas North America will receive a Special Edition - the Limited Edition that is to be released in Europe and Australia will consist of the game, itself, (obviously. xD), Character Cards and a 3 Disc CD Original Soundtrack. North America's Special Edition of Fire Emblem Warriors will also consist of the exact same content as the ones that had been previously stated in the Limited Edition for Europe and Australia, however a dual-sided poster is also added into the Special Edition. Nice to know Nintendo still hates female players. My biggest hope since the announcement was to be able to play hector and using armads and just bash trough every single enemy. To bad that I haven't got money.